I can't believe it's already the third month into this year, isn't it crazy how fast it's gone already?! 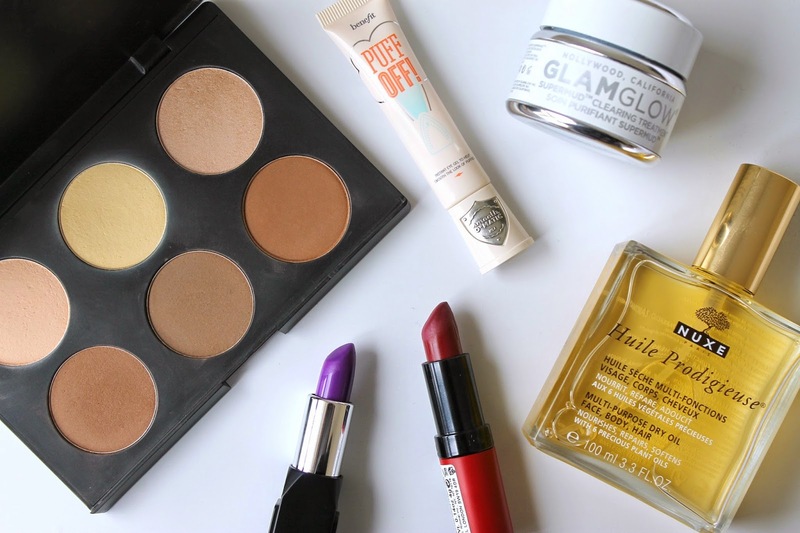 Here are some of the products I have been loving this month! A cross between a red and berry, this lipstick has been my go to colour when I'm looking for more of a polished look with my makeup and it's also perfect to wear anytime, day or night. The formula of these lipsticks are amazing and long lasting, they also keep my lips moisturised and don't give that chapped feel! Think back to your childhood and that grape flavoured Hubba Bubba gum and that's the exact scent of this product! A gorgeous, cool-toned purple that rivals that of MACs Violetta. Long-wearing, pigmented and hydrating, this lipstick has definitely sneaks into my top 5! I will definitely be purchasing more of the Shanghai Suzy range. There's something about French Skincare that's luxurious and makes you feel so sophisticated and this product is no exception. After having recently discovered it from a PR sample, I went out and bought it for myself and it's now one of my most cherished products! It also has a beautiful fragrance that lingers all day! I wish there was a body mist or perfume in this scent, that's how much I love it! This Australis Contour Kit had everyone in a frenzy when it sold out last November, so naturally when it was restocked, I grabbed it the first chance I got! I love all these shades which are perfect for contouring and highlighting on most skin types and I love using the yellow highlight under the eyes on darker skin! Beautifully pigmented, this contour kit is such a fantastic price for what you're getting! At $75 a tub, it's hard to justify spending this much money on a face mask so when I received it as a Christmas I was over the moon. I can definitely see what all the hype is about as it really draws out those impurities and helps renew the skin. I've been using it sparingly and alternating it with my Origins Active Charcoal face mask which is definitely cheaper as achieves similar results- albeit, not as well as the GlamGlow does. I've mentioned this product before but I will mention it again. Delivering instant results, this product does not disappoint and it's cool metal tips helps relieve puffiness of under eye bags- win! I so wish I could afford the glam glow. Everyone RAVES about it! Looks so luxurious. In all seriousness though, it's pretty great product and works like a dream- I just wish I had the bank balance to buy it regularly! Really enjoyed your video, Anjelique -h ow I like your lovely and laid-back personality! That Kate Moss lipstick swatch looks amazing and I've been curious about the Nuxe dry oil so thanks for talking a little bit about it :) Do you find it hydrating when you apply it to your skin or is it mostly for the scent? Seriously go invest in that lipstick- I promise you won't regret it! The oil is so lovely and has such a fresh scent! I would say that I've tried a few body oils and this is my fave, it moisturises really well and leave my skin feeling so smooth! I almost bought that Benefit eye gel recently but I didn't know if it would be any good. Guess I will give it a go! I say give it a go! It's pretty instant results, goes on quite cool and then dries almost velvety! See if you can give it a try in store first! I would recommend trying it without any makeup on! Reading this post reminds me that I have yet to write my monthly favourite..I miss January and I think will be missing February too. I'm such a naughty blogger, tsk! LMAO at the beginning of your video, you have such a lovely personality and I love that you don't take yourself too seriously! I sniffed that Nuxe oil before, but I think it was the one with shimmer but the jasmine scent was so strong that it gave me a headache. :-/ I really need to get my hands on Rimmel 107, I swear I'm the only one in the beauty world who doesn't own it! Haha Oh, I know the feels! You are really too kind! :) Ah, I haven't tried the shimmer one, maybe I'll go give that a sniff too! 107 is life, get on it!